You know how when the first snowflakes fall, they are so delicate you hardly know they are there? Well I'm from Florida so I really don't know if that's so, but these earrings are so incredibly lightweight and delicate you hardly know they are on! And they are so lovely and interesting, you won't forget you're wearing them! 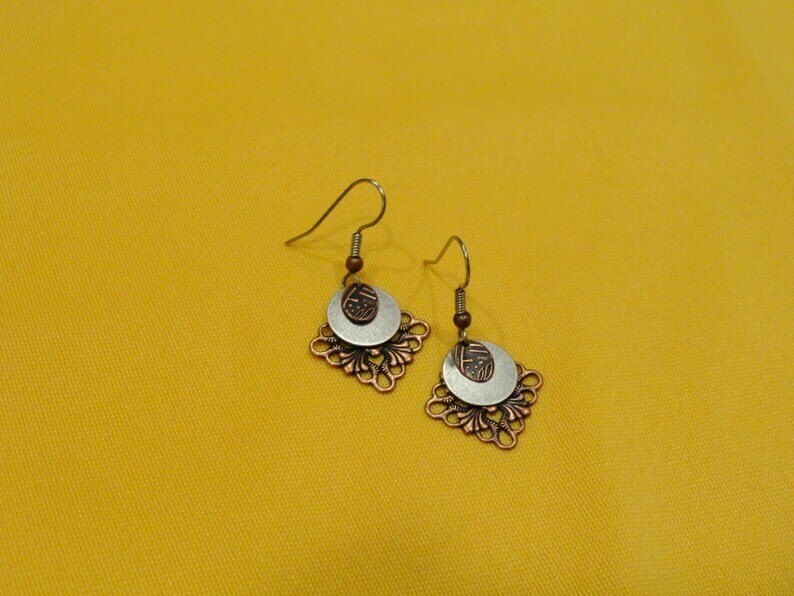 The delicate lacy antique copper filigree piece reminds me of a snowflake and peeps out from behind a small antique silver disc and a tiny etched antique copper oval. All 3 pieces hang from a surgical steel earwire accented with a copper bead. From the top of the earwire, they measure 1-1/2" and are 3/4" across.